Have you ever wondered how some entrepreneurs are able to run companies and manage teams even while they’re traveling around the world or relaxing on a beach in Hawaii? Well, the secret is pretty obvious. Most companies these days use project management apps to build a virtual working environment on the cloud. This allows the employer to not only keep tabs on the team from anywhere in the world but also lets the employees work remotely from anywhere they want. You must have already heard the names of some of these project management apps like Trello and Basecamp, but you’re still not 100% sure which one’s the right app for your web design agency. We’re here to solve that problem. In this article, we take a closer look at some of the best project management apps available today to help you find the perfect app for your business. So, prepare to say goodbye to emails, once and for all. Basecamp is one of the oldest and most popular project management apps on the web. It’s been around since 1999 and over 100,000 companies currently use Basecamp for managing their projects and teams. The app comes with six useful tools to help you manage different parts of your project. Message boards and comment threads for leaving feedback on project files. Real-time chat and pings for communicating with your team. Automatic check-ins for getting status updates from your team on a recurring daily/weekly schedule. To-Do lists for organizing work and breaking down work into small tasks. Document and file storage for organizing your work files. A centralized schedule system for tracking your milestones, goals, and deadlines. Working with Basecamp is simple. You just create a new “Basecamp” for each project you’re working on and members of your team will be able to see and manage each aspect of the project separately from there. Basecamp also includes Android and iOS apps for working through mobile devices. You can sign up with a Basecamp account for free to check out its features. Then you can get started with the $29/month plan for managing small projects or $79/month plan for bigger projects. Both plans let you manage unlimited team members. Zoho Projects is yet another popular project management app used by thousands of companies around the world. Intel, Jaguar, Timex, IKEA, Nascar, are among some of the big brands that use this tool to manage projects. Similar to Basecamp, Zoho Projects comes with its own set of features to let you handle your projects easily. A set of Project Planning tools, including tasks lists, subtasks, recurring tasks, milestones, etc. Gantt Charts for visualizing the progress of your projects. Project Feeds for coordinating and keeping track of your projects through a timeline. A Timesheet to track your team members to log their billable and non-billable hours. Reporting tools to get detailed reports on team progress. Document management tools for sharing text, document, and presentation files. With Zoho Projects, you can properly organize your projects by creating new Project Feeds for different types of projects you’re working on and break down those projects into smaller tasks to assign work to your team members. You can test-drive Zoho projects for free or switch to the $25 per month plan for managing 20 projects, $50 per month for 50 projects, and $80 per month for unlimited projects. All plans come with unlimited users. 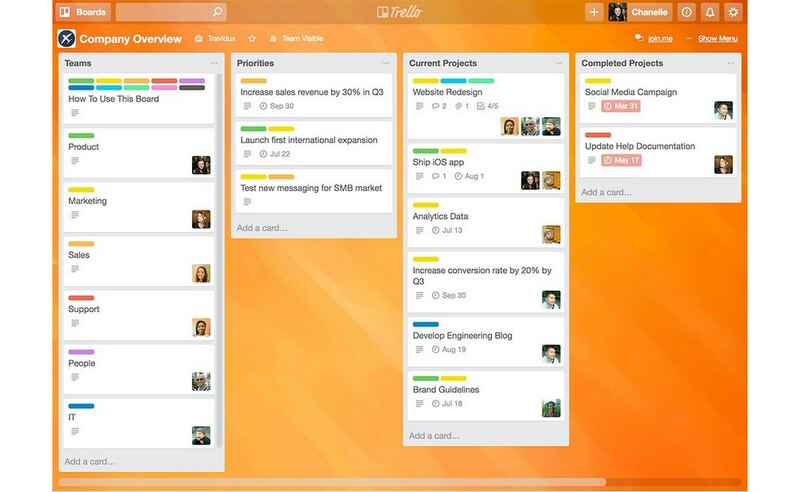 Trello is one of the simpler project management tools on the web, but it’s also one of the favorite tools among many Fortune 500 companies. Adobe, Pixar, Google, PayPal, Kickstarter, are among the many companies that are fans of Trello. The beginner-friendly interface is one of the best features of Trello. It makes things much easier for you to get your team onboard the platform. Trello boards for creating list of lists for assigning tasks for team members. Create checklists, upload attachments, add due dates for your tasks. Start discussions and leave comments for sharing feedback. Real-time updates on your project progress. Advanced search, filtering, and labelling features. Trello simplifies your project management with a card-based user interface, where you create new boards with stacks of cards for each project you manage. Each card comes with features for scheduling and assigning tasks to your team members. You can use the Free version of Trello to create unlimited boards and manage an unlimited number of team members. The $9.99 per user/month plan will allow you to take things further by connecting third-party apps like Evernote, MailChimp, Github, and more. For larger companies, there’s a $20.83 per user/month plan with even better features. 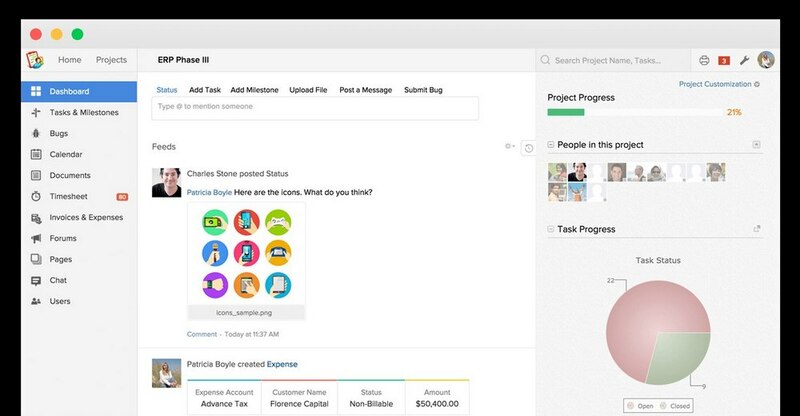 Asana is a project management app that takes a different approach. 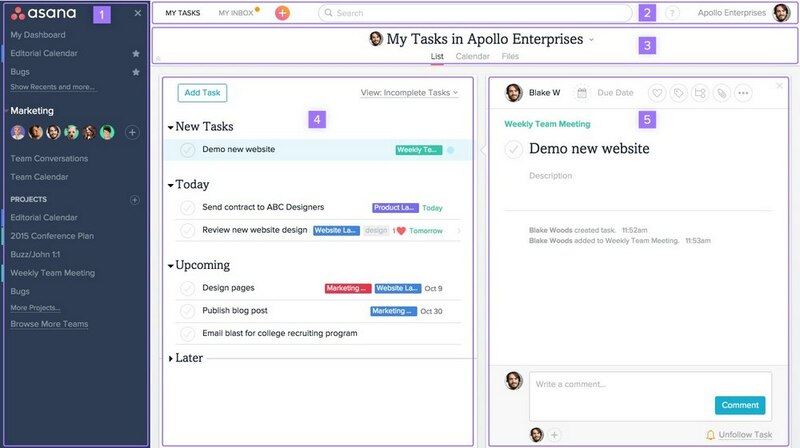 Asana focuses on a better task management system to help improve team productivity. Many startups and corporate companies like Uber, Dropbox, Stripe, Airbnb, and Samsung use Asana for managing their projects. Asana’s beautiful user interface and the smooth user experience make it a great work environment for a web design team. The app also includes a set of great features. 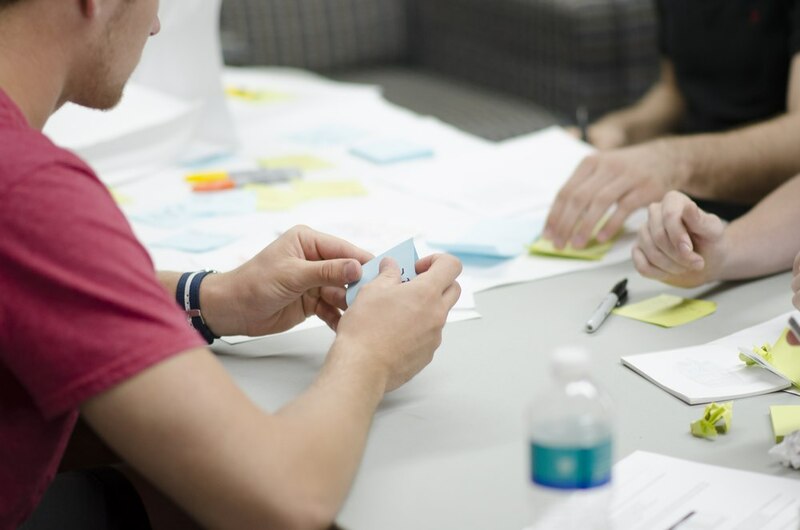 Create lists of tasks for assigning work to teammates. Organize those tasks in shared Projects. Structure your projects using Sections. Set due dates and times for each task on your project. Upload attachments and share files with your teammates. Leave comments on tasks and communicate with the team using Inbox messages. Much like Trello, Asana also lets you manage projects by creating lists of tasks and including subtasks. Then you can assign different tasks to different team members to get work done accordingly. You can use Asana for free to manage a team of up to 15 members. For bigger teams, you can sign up with the $8.33 per member per month plan. In addition to these great apps, Wrike, Mavenlink, 10,000ft, and Casualare a few of the other great project management apps that are worth checking out. It’s time you leave your locally shared computer networks and old desktop project management software in the past. Get started with a project management app to let your team experience the freedom of work and help organize their projects on the cloud.